I was just raking up the last of the fall leaves and though that I’d like to get some photos of the kids jumping in my big leaf pile. The image I had in my head was one of those amazing fall days where that gorgeous warm glowing late day sunshine was back-lighting the leaves and highlighting the kids. Problem was: by the time I was done raking the leaves, it was petty late in the day so most of my yard was in shade, and the ambient light that was available was coming from the wrong direction. To get the photos I wanted, I decided to fake that late day warm sunshine glow with strobe sunlight. In this article, I will show you how to do it yourself (its actually pretty easy to get great results)! Here is an example of the style of photo I knew that I wanted to create. You’ve probably seen this style of image a million times – that warm late day sunshine glow just feels so cozy and inviting – it’s no wonder this look is so popular. However, unless you happen to be in exactly the right place at the right time, you can’t take this photo…unless you fake that sunshine glow with a strobe. As you can see, without the strobe the ambient light photo is pretty boring and totally flat. In this case it actually was a fantastic sunny fall day, but if I wanted to photograph the natural glow from the actual late day sunshine – I would have to face the opposite direction – which was out towards the street with a bunch of ugly parked cars. The window for capturing this type of sunlight is also extremely short – about a half hour before sunset – so there was really no way I could have been in the right place at the right time to capture this scene how I wanted with just ambient light. To create this look, I used an Elinchrom Quadra Strobe with an Impact Luxbanx Small Octagonal Softbox (36″) along with my trusty Nikon D800 with a brand new Sigma 85mm f/1.4 ART lens. The color of light from the strobe was warmed up with a full color temperature orange (CTO) gel to mimic the warm color of actual golden hour sunshine. When I started shooting it was actually still pretty bright out, and I wanted to shoot wide open at f/1.4 so I used an Elinchrom EL-Skyport Plus HS transmitter. The EL-Skyport Plus HS transmitter along with the Quadra Strobe allowed me to shoot a few stops faster than my camera’s strobe sync speed – allowing me to shoot wide open at f/1.4 with a strobe, even with relatively bright ambient light. When I started photographing the kids it was just before sunset and it was still pretty bright out. However the light was dropping quickly – so I set my camera to aperture priority (A). I wanted to slightly underexpose the foreground and background, so I set exposure compensation to -1. The strobe power was set manually by eye to properly expose the background and rim lighting without blowing out any highlights. The specific camera settings I used were: aperture f/1.4, ISO 100, daylight white balance. The shutter speed started up around 1/800th of a second (using the Elinchrom Skyport Plus HS trigger for high speed sync) and dropped down to around 1/60th by the time I was done. The strobe was set behind my subjects and just out of the frame to the side. This allowed me to use the front of my house as the background – although I did have to move the cars out of the driveway to avoid them cluttering up the frame (even with the awesome bokeh of the Sigma 85mm f/1.4 ART lens the color of the blue car in the driveway didn’t match the feeling I wanted for the images). Although I did use a 400 Ws strobe and an octagonal softbox to light this particular scene, I could have just as easily achieved very similar results with a hotshoe flash and shoot through umbrella. The quality of light from the umbrella would be slightly less directional, but other than that, the only real difference is the power available from a studio strobe versus hotshoe flash. With a hotshoe flash I would have had to get the light closer, and I would have had to wait until the ambient light was dim enough to balance with the light from the flash – but other than that the procedure and camera settings would be exactly the same. I did do some minor post processing with Lightroom. Although I captured these images with a daylight white balance, I decided that I wanted to warm them up a little more – so I increased the white balance to 6800K. Then I did some minor adjustments to the contrast, highlights and black level. For the close-up portrait images, I felt that my subject’s faces were just a little too dark, so I brightened them up a touch (+0.25) with the adjustment brush. Do you think that it was worth the effort of adding strobe sunlight to this series of images? Or would you prefer to photograph this scene with just the available light? 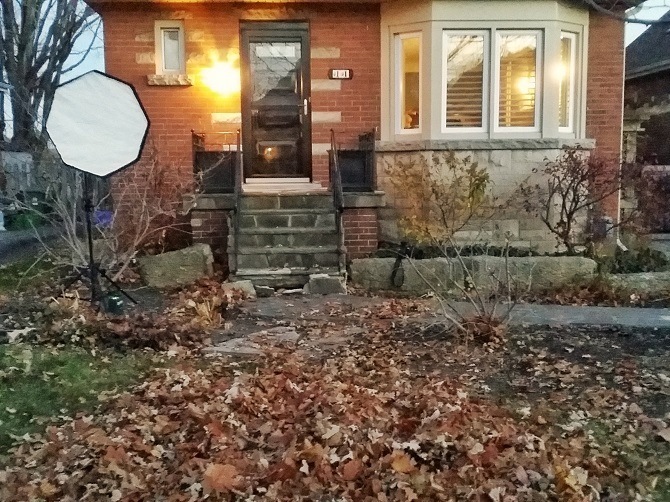 If you’re trying to do this with a strobe you might not have enough power to use a modifier. Shouldn’t be a problem as the hard light of a bare speed light replicates sunlight pretty well. Good luck. I’m going to give it a try too. How did you gel the soft Box? Good question – I put velcro tabs on the speedring and then velcro a circular piece of gel sheet the same diameter as the ring on top. This is probably my favorite article from this site in a long time. It’s something ‘fairly simple’ to pull off, but very effective in enhancing the image. I hope to try this out soon with a speed light and a couple different modifiers. Nicely done and pretty darn effective. Great tip. Thank you.